We’re knee deep into fall and it’s another week that is attempting to offer something for everyone. The big guns are clearly being saved for November as once again the films are mostly solid, but there will be few fireworks at the box office. 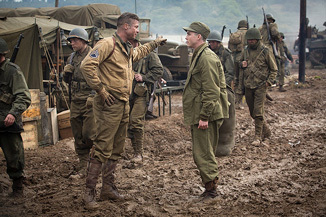 Fury brings us Brad Pitt in a World War II movie, but it’s more Saving Private Ryan than Inglourious Basterds. Pitt (with the convenient nickname of “Wardaddy”) leads a small division in a Sherman tank deep behind enemy lines in Nazi Germany as the Allies make a charge. While it’s obviously banking on the star power of Pitt, also along for the journey are Michael Pena, Jon Bernthal, and in his first major role since his numerous public meltdowns, Shia LaBeouf. Directed by David Ayer, he of the failed Arnie comeback vehicle Sabotage from earlier this year, but also of the well received End of Watch, Fury is getting largely positive reviews for its strong acting and brutal depiction of war. It’s not quite Oscar material, but it certainly seems like An Important Movie. While I mention Pitt’s star power, it doesn’t always translate to box office; for someone who is arguably one of the most famous people on the planet, he has only three movies in his entire career that have grossed over $150 million domestically. His tendency to pick smarter projects over the typical blockbuster brings something to what seems to be a somewhat typical WWII movie. That’s likely to push Fury to a weekend of $27.8 million. We’ve still got a few weeks until Big Hero 6 so this weekend the Day of the Dead-themed The Book of Life will have to do for kids really jonesing for something animated, what with the loss of Saturday morning cartoons and all. A fantasy adventure musical of sorts, it’s got voices of Diego Luna, Zoe Saldana and Channing Tatum as the main characters, and the animation house was previously responsible for last year’s Free Birds, a film I’m 100% sure we all had forgotten about until now.